I spotted these two signs in the 222 Glenwood building on Glenwood Avenue. The large retail space in this condo building has always been empty but hopefully that will change. 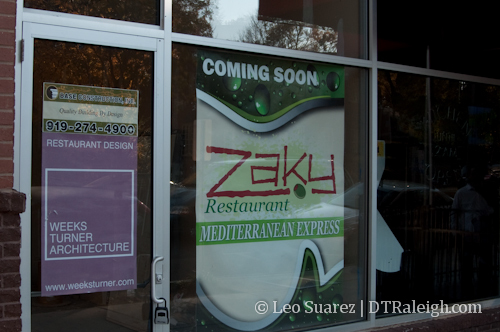 Zaky and Tutti Frutti will take up some space here but still leaving some room available for one more at the end of the building facing the intersection of Lane Street and Glenwood Avenue. Very little work has taken place inside so we’ll keep an eye on this new addition for now. It makes you wonder how many frozen yogurt eateries this area can sustain. 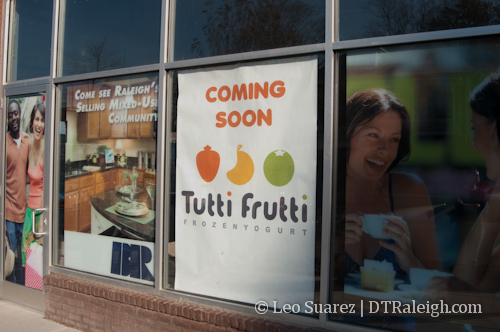 Local Yogurt, Fresh Berry, Marmalade Skies, and now Tutti Frutti?! As far as Mediterranean we have Jasmin’s, Pita Pit (kinda Mediterranean), Neomonde, and Greek Fiesta. Should be interesting to see how these places pan out. Jasmin’s and Pita Pit are going to see 90% of their business from college students. Neomonde and Greek Fiesta aren’t anywhere close to the same area. (and I love neomonde), but there really isn’t a good gyro anywhere in the downtown grid. (I haven’t tried Shish Kabob yet, but here its great). Shish Kabob would have been a better example, but these places will both do fine. Plenty of soccer moms, and downtowners will gladly stop at glenwood south to grab yogurt as opposed to heading down h-boro street to wrestle with 19 year olds. Most of those yogurt places are well outside the downtown vicinity. Are there any within walking distance of downtown? My sister told me several months ago about a frozen yogurt craze that has hit the college town she lives in. The town is quite a bit smaller than Raleigh and sustains several of these fozen yogurt/moshi establishments. I thought that this would be a great business in the downtown area when she mentioned it, I guess someone else thought so as well. We’ll see. As for Mediterranean, I’m all for it in that location, but I think this segment might be harder to sustain. Village Kabob on Peace St. (not Mediterranean, but similar type food) seems to have closed recently, replaced by Sahara Cafe. I don’t know if it is a location issue, or what, but the food was delicious. I’m just glad to see something making an attempt in that empty space! I would have preferred some kind of retail, but at least it won’t be empty. Surely there is enough business for all these Yogurt shops to stay open. I mean look at all the successful Jamba Juice, Water Ice and Cold Stone Creamery shops that have popped up all over the country. You never see any of those places closing. Saying there isn’t enough business for all these places is like saying Oxygen bars are just a fad. @Deb- there is one place already in the main part of downtown that has frozen yogurt: Crema on Fayetteville Street. You have to specifically ask for yogurt–if you just ask for a “cup of vanilla” for example, they’ll assume ice cream. But they also have frozen yogurt too.